When Will the Next Housing Market Crash Take Place? I’ve noticed a trend lately. Everyone’s a real estate expert. It seems the most recent crisis and recovery has turned just about every single person into a guru on all things to do with home buying and selling. I suppose part of it has to do with the fact that the massive housing bubble that formed a decade ago swept the nation and was front page news. It also directly affected millions of Americans, many who serially refinanced their mortgages, then found themselves underwater, then eventually short sold, were foreclosed upon, or held on for the ride back up to new heights. It’s a common conversation piece these days to talk about your local housing market. Thanks to greater access to information, folks are scouring Redfin and Zillow and coming up with theories about what that home should sell for, or what they should have listed it for. Neighbors are getting upset when nearby listings are not to their liking for one reason or another. What were they thinking?! But will it be different this time around? All of this chatter portends some kind of new bubble mentality in my mind, though it seems everyone is just basing their hypotheses on the most recent housing bust, instead of perhaps considering a longer timeline. One could look at the recent run-up in home prices as yet another bubble, just a few short years since home prices bottomed. After all, many housing markets have now surged beyond their previous lofty levels seen a decade ago. For example, Denver area home prices are 45% higher than they were in 2007. And back then, everyone felt home prices were completely out of control. But they say bubbles are financially driven, and we’ve yet to see a return to shoddy underwriting. I will say that there’s been a recent return of near-zero down financing, with many lenders taking Fannie and Freddie’s 97% LTV program a step further by throwing a grant on top of it. This means borrowers can buy homes today with just 1% down payment, and even that tiny contribution can be gifted from someone else. So things might be getting a little murky, especially if you consider the increase in prices over the past four or five years. One could also argue that affordability is being supported by artificially low mortgage rates, which history tells us won’t be around forever. But When Will Home Prices Crash Again?! All of this makes one wonder when the next housing market crash will take place. Home prices can only go up for long before they drop again, right? Well, the answer to that age-old question might not be as elusive as you think. The real estate market apparently moves in cycles that some economists think can be predicted to a relatively high degree. While not a perfect science, there seems to be “a steady 18-year rhythm” that has been observed since around the year 1800. Yes, for over 200 years we’ve seen the real estate market follow a familiar boom and bust path, and there’s really no reason to think that will stop now. Another bust in inevitable, despite folks telling us we’ll never get back in again if we sell our home today, or don’t buy one tomorrow. There are four phases to this cycle, including a recovery phase, which we’ve clearly experienced, followed by an expansion phase, where new inventory is created to satisfy demand. This is happening now. That is followed by a hypersupply period where builders overshoot the mark and wind up with too much new construction, at which point prices plummet and a recession sets in. The good news (for existing homeowners) is that according to this theory, we won’t see another home price peak until around 2024. That means another eight years of appreciation, or at least no losses for the real estate market as a whole. So even if you purchased a home recently and spent more than you would have liked, it could very well look cheap relative to prices a few years down the line. The bad news is that the real estate market is destined to stall again in just eight short years, meaning the upside is going to diminish quite a bit over the next few years, especially in some markets that are already priced a little bit ahead of themselves. But perhaps more important is the fact that home prices tend to move higher and higher over time, even if they do experience temporary booms and busts, so if you don’t attempt to time the market you can profit handsomely over the long term. Very interesting, the chart is very helpful. As an investor, opportunities come even when the market is high, just have to analyze better. Indeed, in the past few years you could essentially buy anything, anywhere and still do quite well. That’s beginning to change. I agree the market will peak in 2 years with the decline starting in 2020. 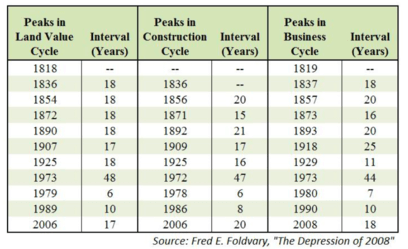 Hopefully a little longer than that…or at least a plateau for a while…I think everyone always thinks peaks (and recoveries) will happen sooner than they actually do. Totally agree with Wokkawokka 7, the housing hyper bubble is about to burst and sooner than many think. I watch market trends very closely as well, and have for years, with accurate predictions. I’ve noticed not only the staggering number of foreclosures, but pages of price drops on listings in locations that were hot six months ago. A flurry of inventory coming on the market too, and so late into the summer is unusual and most likely a sign that sellers want to get out while they still can. Why is it going to burst? What will be the catalyst? Very few people have ARMs or unaffordable mortgages, nor do they have better options if they move/lose their current homes. When do i purchase a home? Do wait until the market crashes so i can buy the home at a low price? or do i buy a home now, as the price goes up? If i buy now while prices are rising, im just going to lose market value when i sell in 5 years… so wait until everything crashes, buy, then it only goes up from there…. right ? Remember, a home isn’t just an investment decision, it’s also a lifestyle choice. You should want the home for reasons beyond the investment, assuming you plan to live in it. And why are you selling in five years? Ultimately, nobody knows for certain when home prices will peak, nor do they know when home prices will fall. Everyone is just guessing and making calculated decisions based on their own interests and risk appetite. I will say that home prices are probably no longer on sale, as they were a few years ago, but that doesn’t necessarily mean they’ve topped out either. Or that they’ll fall anytime soon. Lastly, consider the alternative to buying a home? Is there a better investment right now? There will not be an 18 year cycle this time. The cycles will be shorter and faster on average due to technology pacing all things faster in our economy.